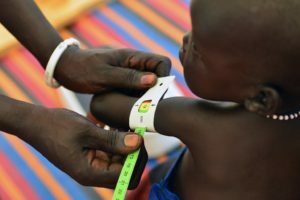 About 224 million people are suffering from malnutrition in Africa as effects of climate change and conflicts bite, the United Nations warned on Monday. According to the UN Food and Agriculture Organization (FAO), the situation is a “cause of concern” as the continent’s population was expected to reach 1.7 billion by 2030. The rise in malnutrition and food insecurity was related to climate changes and natural disasters, Bukar Tijani, FAO’s Assistant Director General for Africa said in Khartoum. Khartoum is hosting a five-day conference on efforts to eradicate hunger and food insecurity in Africa. conflicts in Somalia, South Sudan and the Central African Republic (CAR) further exacerbated food insecurity, Bukar tijani said. Last month, UN chief Antonio Guterres who was attending the 30th African Union summit in Ethiopia said hunger cases are twice higher in conflict affected countries. According to him, majority of under-nourished people in Africa live in countries affected by conflict. He also urged stronger commitment from African governments, the AU, and the UN to promote peace and human rights in a bid to eradicate poverty and hunger. Posted by Geraldine Boechat on February 20, 2018. Filed under Zoom. You can follow any responses to this entry through the RSS 2.0. Both comments and pings are currently closed.